ROM Manager has been a huge part of the Android ecosystem, helping rooted users flash new ROMs and restore backups for years. Unfortunately, it appears that its developer Koush, has run into troubles. Google, without warning, removed ROM Manager from Google Play, citing that the app violates a few agreements that developers sign in to, specifically ones that deal with third party payment options inside of apps downloaded from Google Play. The issue was first addressed by Google, stating that Koush needed to fix a payment flow option for Helium – his data backup application. 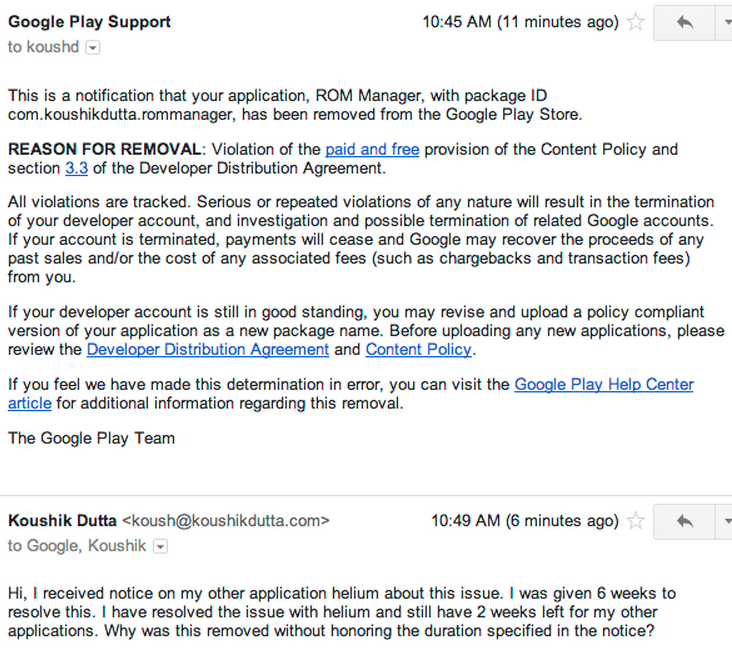 After Koush stated that he had other apps that used the same payment flow, Google skipped past the “you have six weeks to fix the issue,” and went straight to yanking down ROM Manager. As you may know, ROM Manager has hundreds of thousands of downloads, and people rely on it for their rooting needs. Whatever Koush did, it doesn’t appear that Google was very transparent about the decisions they were making with regards to removing it completely. We have faith that Koush will be able to work this all out and ROM Manager will return to Google Play sooner or later. Although, Koush hasn’t promised anything quite yet.